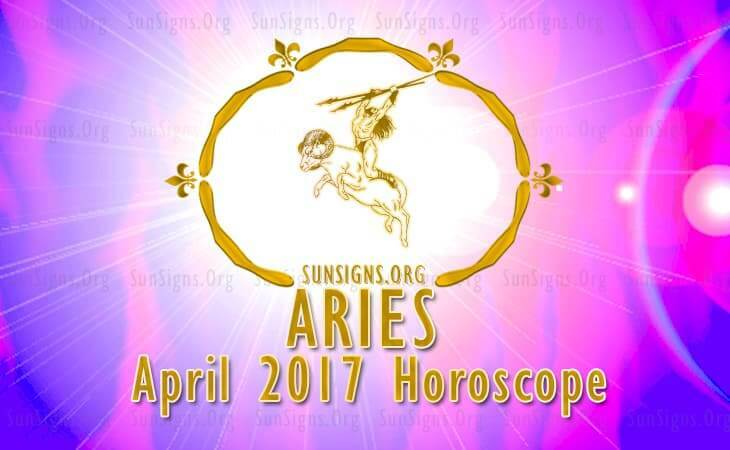 April 2017 Horoscope for Aries zodiac sign foretells that this month will be full of frenzy, turmoil and dynamism. April 2017 is ideal for commencing new ventures and to attain your desired objectives. You have to decide the course of action and follow it with diligence. You have the force and strength to bulldoze your way and overcome all obstructions, Aries. After the 15th of the month, your furious pace will subside and you will be more pragmatic and concentrate on financial progress. The horoscope 2017 for the Aries personality predicts that professionally there will be significant changes. There may be a change of job to another business or modifications to the present job profile in April 2017. The Aries April 2017 monthly predictions foretell that flaws in your monetary plans will come up and you will get a chance to rectify them. Financial strategies will be modified radically and a new policy will need to be put in place. The Lunar Eclipse of April 2017 will affect the fiscal situation of your partner and major corrections may be required to stay afloat. In spite of all the problems of the April 2017 Mercury Retrograde; overall prosperity will be excellent for the Aries born. Your investments will give very good profits. The April 2017 Aries love horoscope suggest that there will be some impact on your love relationships. Married Rams will face volatility in their marital lives and strong bonds will stay alive. Existing partnerships will either be confirmed into marriages and pregnancy or will end in a divorce. There will be more sexual passion in your relationships if you are seeking satisfaction in love life. There will be serious disturbances in the lives of senior members of the family. Aries relationships with children will be under stress and will require healing. The Aries horoscope for April 2017 foretells that your health is excellent. It can be further improved by energetic physical exercises and body massages. You should avoid major surgeries for piles or kidney stones or other health procedures this month. Your energy level will be extraordinary and will provide you with self-assurance to complete difficult jobs. Eating zucchini, broccoli and wheatgrass on a regular basis will prove to be beneficial. The April 2017 Aries zodiac predictions forecast a month of chaos in your love life and many transformations in your career.